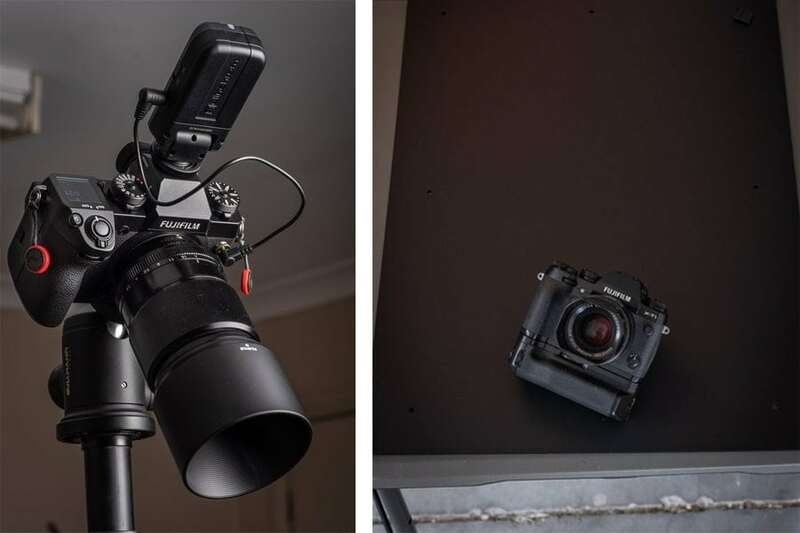 This is a guest post on how to shoot product photography on a budget by production still photographer John Platt. 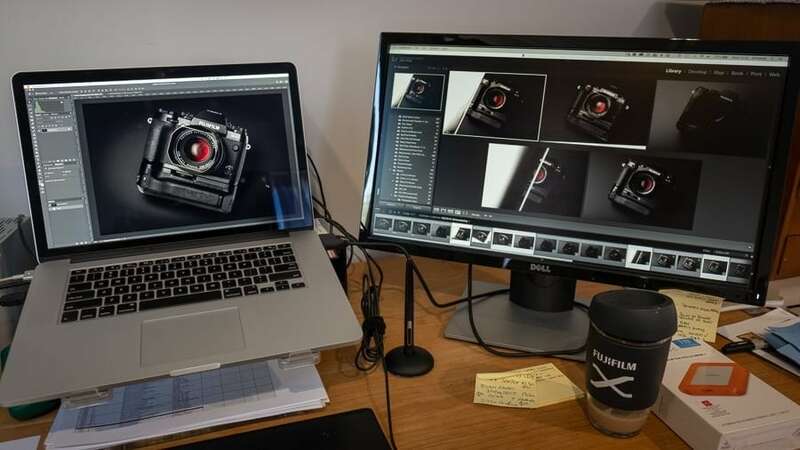 For anybody who thinks product photography involves studios full of flash equipment with assistants employed to do your bidding 24hrs a day, and to operate high-end Macs tethered to hugely expensive medium format cameras… you’re right! You can achieve amazing results in a small space with a single studio flash unit, some white card, multiple exposures, possibly some focus stacking, and an understanding of Layer Masks in Photoshop (or an equivalent app). This article is all about showing you how, but firstly, I’ll tell you a bit about me. My experience in product photography dates back to the late 70’s and the four years I spent as an assistant to a commercial photographer in North Sydney. At the time, Konrad Photographics had the contract for Norman Ross, known as Harvey Norman now. We would shoot all their catalogues and weekly specials in colour and B&W on Sinar 5 x 4” large format cameras. In addition to this work, we shot a huge range of products from jewellery to electronics, cameras, glassware, and food, either on the Sinar 5×4” or Mamiya RB67 medium format camera. We rarely shot on 35mm. In the early 80’s I left the studio and began a career in the film industry. Thirty-five years later I’m back to shooting stills. 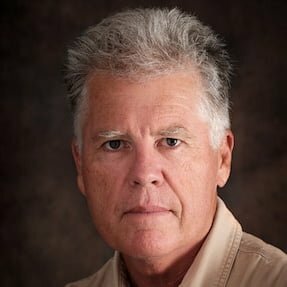 I now work as a production still photographer in film and TV, and write various reviews on the gear I use. My experience in product photography is invaluable when it comes to shooting images to accompany my gear reviews here on Shotkit. I can create a high-end look without the high-end costs. I’m about to show you how, but first, the setup. The garage. Most Aussie homes have one. Even with all that space filled with stuff, there is still plenty of room to shoot. 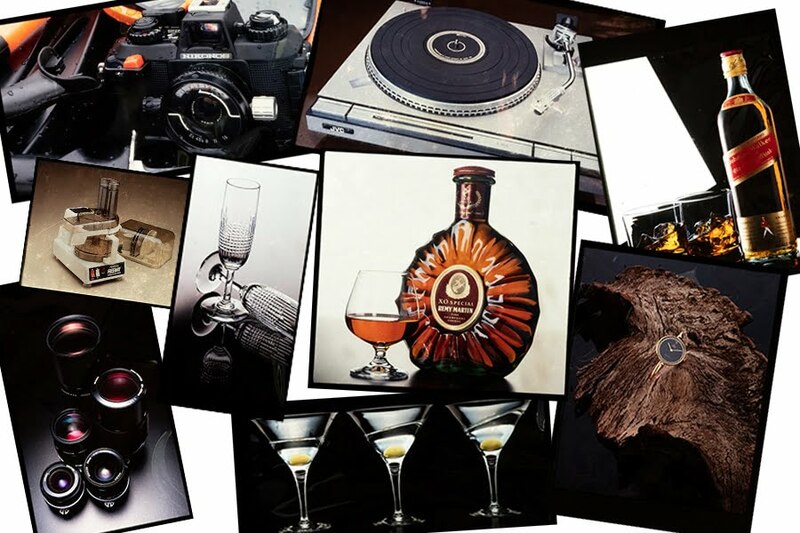 Great product shots are achievable without the immense costs of owning a full studio. I own and use an Elincrom Studio Flash. 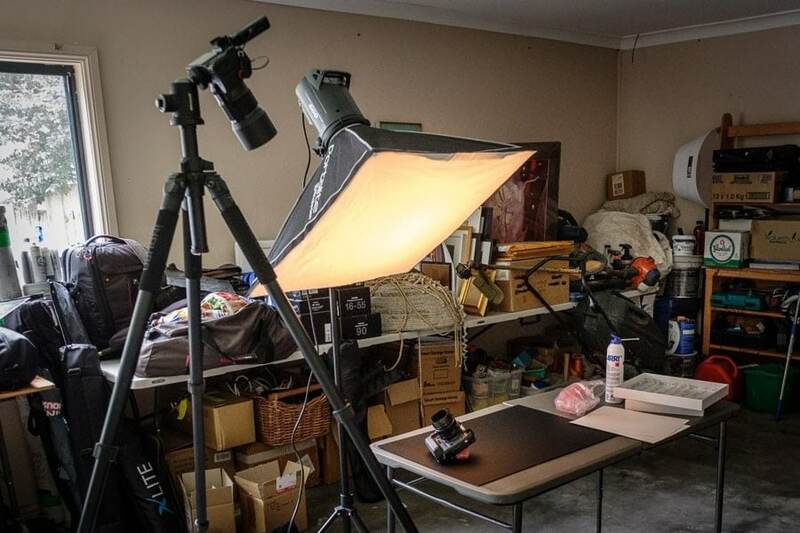 I purchased two BRX-500 kits, each of which included two flash heads, stands, a remote sync trigger and two 66cm square diffusion soft boxes. For this work I use one head and diffuser. Bought separately, the head, stand and diffuser cost around $1,000. I shoot with my Fujifilm X-H1 and usually use the XF 90mm f/2 prime. I then process the results in Adobe Photoshop and Lightroom on a Mac. I also use a Wacom tablet for this work. While achieving these results is easier with a tablet, it’s not essential. Prior to purchasing my tablet, I did all my retouching work with a mouse. I decided to shoot my original Fujifilm X-T1 with battery grip and Fujifilm XF35mm f/1.4 for this exercise. As I mentioned above, I like to use the Fujinon XF90mm f/2 for these product shots. As a background, I use matte black Perspex . There is something elegant and stylish about black on black that I really like. This piece measures 60 x 45cm and is a cast-off from some frames I had made for an exhibition. That’s it. Though it’s still not exactly cheap, you can get fantastic results for a fraction of the cost of a full studio. Now, let’s get into the actual shooting of the product. 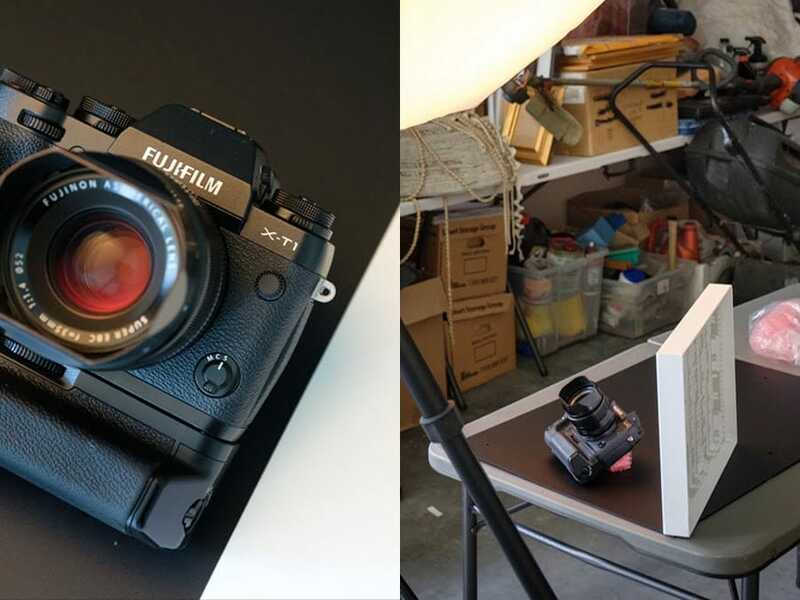 Left: My Fujinon XF90mm f/2 attached to my Fujifilm X-H1 for taking the studio shots. Right: The subject, a Fujifilm X-T1 with battery grip and Fujinon XF35mm f/1.4 . The first thing I do whenever shooting for a review is position the piece of gear in a way that shows it at its best angle. That includes revealing both the manufacturer’s name and the product model. I make sure all caps are in place and that the dials are aligned similarly to the manufacturer’s shots of the same piece of kit found elsewhere on the internet. Once I am satisfied with the position, I make sure the camera that’s shooting is securely locked into its tripod. This is important, as will become obvious later when we get into the post process. Next, I look at the various surfaces of the product and decide which of these I need or want to highlight. With the Fujifilm X-T1 , it’s the nameplate, so I position my light to the left and slightly behind the X-T1 to give me the look I want. I know this will result in a nice soft reflection of the light’s soft box along that nameplate and any other surface that is on the same plane as the nameplate: the handgrip, the battery grip and the front edge of the Fujinon XF35mm lens hood. Once I have determined my exposure, I shoot a number of images, bracketing at 1-stop increments. Normally three is enough: normal exposure, 1 stop overexposed and 1 stop underexposed. When shooting these product shots, I always aim for maximum depth of field, so I set the lens to its minimum aperture. With the Fujinon XF90mm , I use f/16. I bracket the exposures using the camera ISO. So in this example, I use ISO 400 for the normal exposure, ISO 200 for the 1-stop under-exposure, and ISO 800 for the 1-stop overexposure. On studying the result through the viewfinder, I look for other areas of the product that could do with some additional illumination. I usually do this with white cards. You can see how the camera body’s edge picks up the white card. Once I am happy with the look, I shoot more bracketed images, being extra careful not to bump the product or the tripod at any point. 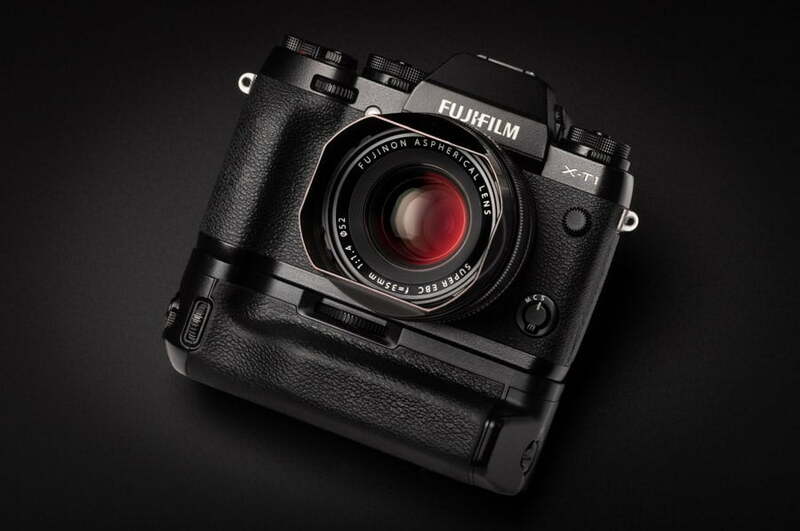 To avoid touching the camera I use the free Fujifilm app to remotely shoot all my images via my smart phone. I use white card to reflect a bit of light onto areas of the product that need it. Lastly, if the product includes a lens, I shoot a specific shot to achieve the most attractive reflections on the various lens elements. I do this by introducing a piece of lighting diffuser – here, I’ve used Rosco 250 trace. All I’m interested in is the lens reflections, so I can mask any other part of the Fujifilm X-T1 to achieve my goal. Once again, I shoot bracketed images. At this point, I shut down my light and X-H1 , remove the SD card, and download the images. Studying the results, I immediately realised the viewfinder block of the X-T1 was lacking detail and needed a lift in illumination. So, back in the garage, I adjusted the position of the light to best illuminate the slightly receding angle of the block. I positioned a small sheet of Blackwrap (a thick, heat-resistant black foil) such that I achieved a nice graduation in exposure across the surface. All my images are now downloaded, and the selection process begins. 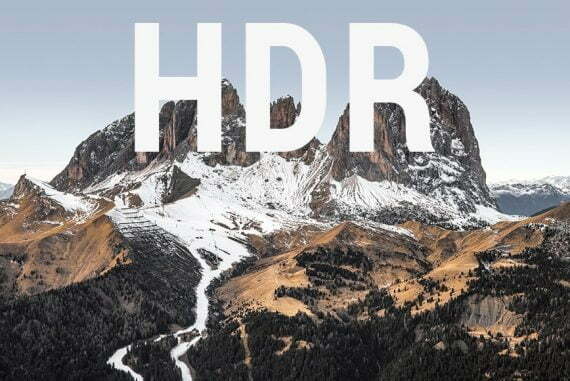 First, I find my Hero image and give it a star rating in Adobe Lightroom. I apply a star to any image I will be transferring to Photoshop. 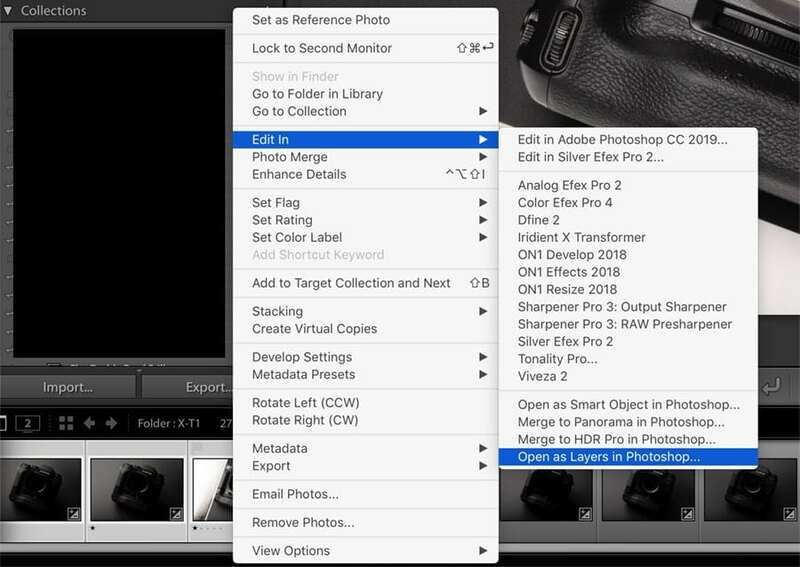 Then, I develop the shortlisted images in the new ‘Advanced Details’ option within the Photo menu of Adobe Lightroom. In this case, I have five images. First is my Hero, followed by two where I have highlighted the side and lower face of the camera battery grip. Then, I have the lens reflection image, and finally the improved viewfinder block image. Selecting all five in Lightroom, I right-click on any image to open up the option panel and make my way to the ‘Open as layers in Photoshop’ option. Opening each photo as a layer in Photoshop. Photoshop will display all images as individual layers (left image). I click and drag the Hero image and place it second from the bottom in the layers stack, with its visibility switched on. Then, I position the layer I want to work with first at the bottom, underneath the Hero image. I also turn its visibility on. The order of the three remaining layers is not important, but their visibility should be turned off. Using the layers to control visibility in Photoshop. 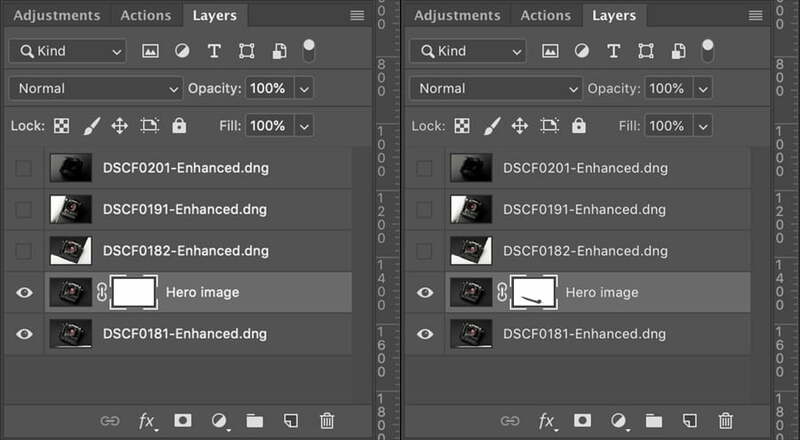 I click to select my Hero image layer and add a layer mask by clicking on the layer mask icon (third icon from the left under the layers stack, left image). I select the brush tool from the tools menu, with black as my foreground colour. Painting with black will remove/erase the section of the image I am working on and painting with white will restore it. This is the beauty of the layer mask: it is non-destructive. Any mistakes can be easily rectified. A shortcut to setting the brush tool size is to click and hold the Control + Option keys (Control + Alt on a PC) and left key on your mouse (if you are using one), and drag. This will change the size of the brush and is much quicker than going into the brush tool menu every time you want to adjust its size. As a default, I use the brush tool with its hardness set to zero. 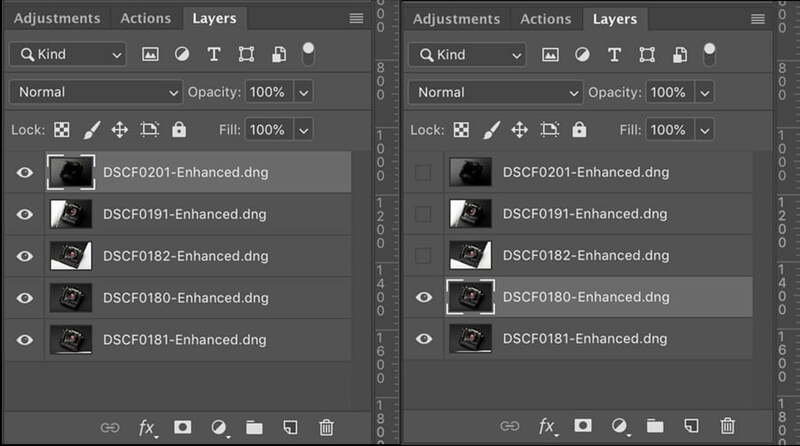 Using layer masks to make minor edits in Photoshop. Having set the brush size, I simply paint over the area of the Hero image that I want to remove. As I paint, I see this replicated in the layer mask thumbnail. As a tip, I like to set my brush opacity to around 30%, maximum 50%. This allows me to remove the areas I want gradually by doing multiple passes. Remember if you feel you have gone too far, simply click on the x key. That will swap the foreground colour to white, and you can restore the erased part of the image. By toggling the visibility of the Hero image layer on and off, you can easily see the results of your work. You can see the improved lighting at the bottom right of the booster grip in the before and after comparison below. Once I am happy with the results, I command-click (control-click on a PC) on the bottom layer to select it along with the Hero layer. Then I click and hold the shift + command keys (shift + control on a PC), while clicking the “e” key. This will flatten/combine the two layers, leaving the Hero image layer with the brush tool adjustments in place at the bottom of the stack. I build the image by repeating the process with each successive layer. I select the Hero image and drag it to the second from bottom position on the layer stack. Then I add a layer mask. Gradually adding highlights to the main image by using layer masks. 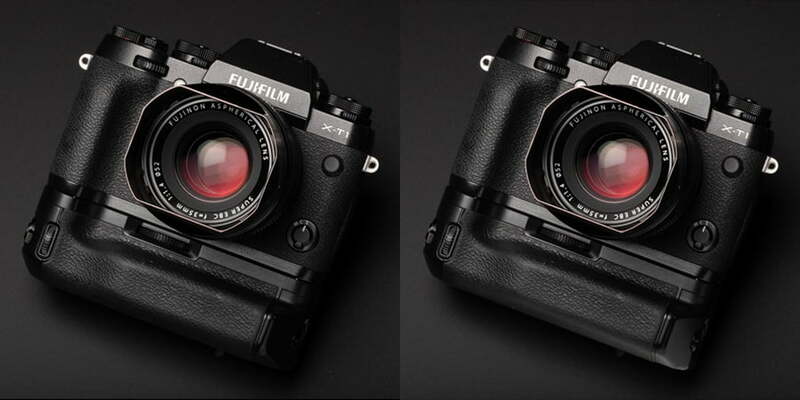 In the left-hand side image below, I have worked on the right side of the Fujifilm X-T1. It now has a lovely highlight running all the way from the base to the top dials. Additionally, the side of the viewfinder block is enhanced, as are the highlights on the focus ring and subtle highlight on the lens hood. The centre image takes all of the left-hand image and adds the beautiful soft lens element reflections. The right-hand image has the graduation of the viewfinder block added to finalise the layer work in Photoshop. Right image: Layer work in Photoshop is finalised. 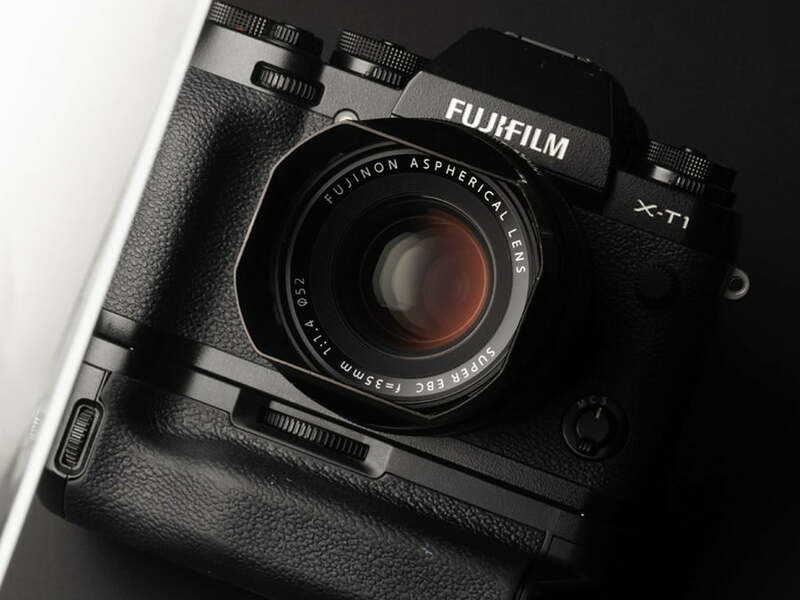 The next step is to use the spot healing tool (placed between the eyedropper and brush tools in the tool menu) to remove any dust spots, blemishes, scratches, or marks on the X-T1. You have probably noticed the bulge in the X-T1’s side door. It came about due to user error and will still close, but not flat as it should. I used the spot healing brush to even out the tones and then the liquify tool to remove the bulge. Now that the final Hero image has been saved back to Lightroom, I will finesse the highlights and shadows. First, using the adjustment brush, I increase the brightness of the highlights on the left-hand top dials to match the right-hand top dials and separately brighten the M, C, and S letters on the focus mode switch. Next, using the radial filter, I reduce the exposure on the Fujifilm nameplate. 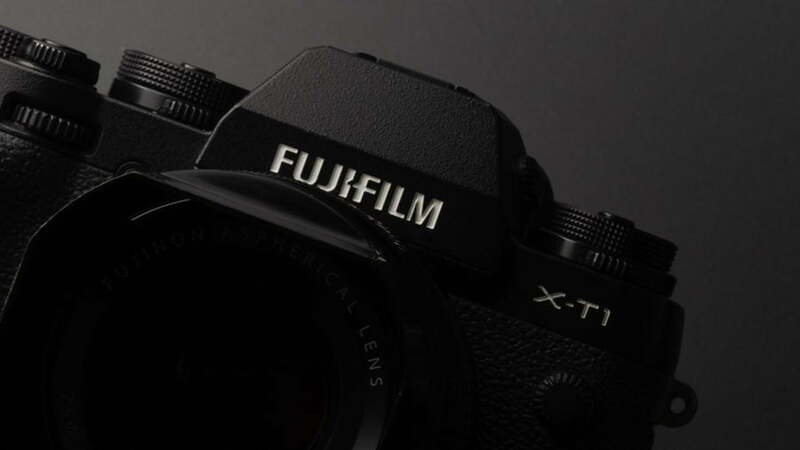 This adds contrast between the black background and the white of the Fujifilm name. Next I add some saturation to the reflection in the lens element, and separately brighten the two highlights to the left of centre. Again I use two separate radial filters to achieve this. I then add a vignette using the post cropping vignette panel. Finally, I sharpen the image overall… and we’re done! The final image – Studio quality product photography completed on a budget. As you can see, this is an extremely efficient way to achieve great results with restricted space, time and equipment. From start to finish, it took roughly three hours to produce the final image. This includes setup and take-down of the gear. If you are new to product photography or Photoshop and Lightroom, you’ll soon learn there are multiple ways to complete any process. 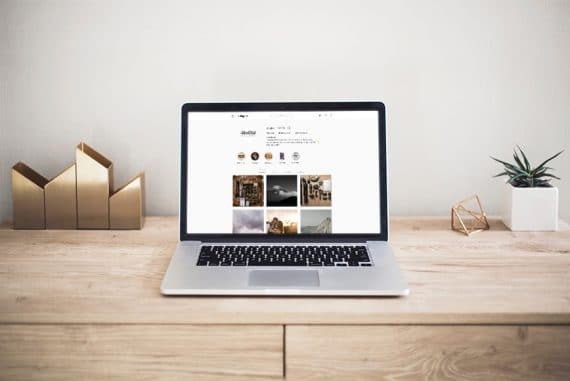 It can be a pretty steep learning curve but the beauty of digital photography means we no longer have the cost of film and processing to consider. You can experiment to your heart’s content, and all it’s going to cost you is time. 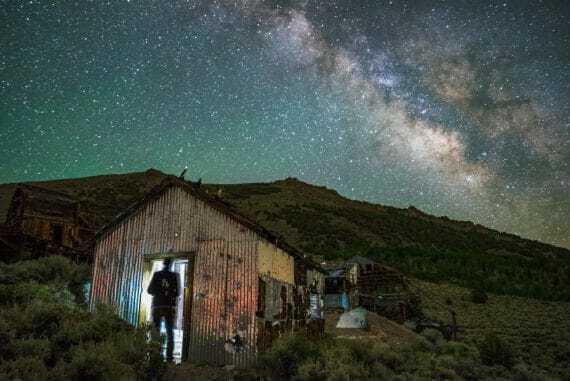 The processing power of apps like Adobe Photoshop and Lightroom, as well as all the others on the market, give us the power to create images in ways I would never have dreamed of when I first started in photography. We are spoilt for choice, and the sky’s the limit in what we can achieve. The techniques I use and the way I complete each step is what I have found works best for me. I don’t profess to be an expert with either of the Adobe apps. I know my way around them and have been using them both in my workflow for many years. I continue to learn and am always happy to be shown more efficient alternatives to the way I complete tasks now. John Platt is a Unit Still Photographer working out of Sydney, Australia.